A pizza deliveryman in need says he's "glowing" after receiving an unexpected donation of $1,900 in the form of a tip from one Anchorage congregation. Kenneth Felber has been delivering pizzas for 14 years, and until last Saturday his biggest tip ever was $100. Chugach Church Pastor Dasaid he and his congregation had set out to bless someone and phoned local businesses to find someone who had a financial need. Felber, 53, they discovered, had experienced some financial and medical setbacks and members decided to take up a special offerring for him during one Sunday service. "We got the idea [from] a conference at Bayside Church in Granite Bay, California, called 'Drive' back in May where they did the identical thing with the conference," Krause told The Christian Post on Thursday. "They ordered pizza, found a young lady who had financial hardships, had her deliver pizza on stage and gave a huge tip to her." The church, which usually meets at Begich Middle School in Anchorage for services, ordered four pizzas last Sunday. Krause was preaching a sermon on hope that day and he wanted to demonstrate the teaching by giving "other people hope." Krause and the church set it up so that Felber would deliver the pizzas and when he walked into the church on Sunday he was greeted by an entire congregation who were anxious to bless him, according to KTUU. With a smile on his face, Felber approached the stage to hand the pizzas over to the pastor who blew him away with his next few words. "This is the strangest pizza delivery you've ever made, I'm sure," said Krause to Felber. "We talked yesterday to Justice, one of your store managers, [who said] we have a guy on staff who's a fantastic employee who's dealing with some medical issues and financial hardships. So let me ask you, what's the best tip you've ever gotten for delivering pizzas?" Felber said the highest tip he ever received was $100. That's when Krause handed him a stack of cash amounting to $1,900 which is $900 more than the church initially aimed to raise. "How does a tip of $1,900 sound?" the pastor asked. "As I walked in the whole crowd [stood up] and then started clapping. I'm just going to be glowing for the rest of the day, the rest of the week!" said Felber, describing the experience to KTUU. Krause hinted at plans to bless Felber one day prior by posting a story on his Facebook page about a Domino's driver in Ohio who was given a $1,046 tip from Sycamore Creek Church. 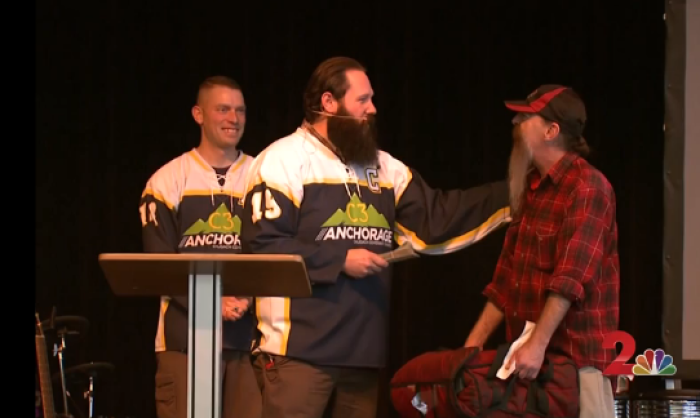 Chugach Church's act of kindness has attracted attention from the media and Krause said he was concerned about Felber "being thrust into the spotlight." "Fortunately, I think he's doing well and he's very excited and thankful about the whole thing," said Krause, who explained that the church never intended for the gesture to receive the type of media attention it did, adding that a professional video crew ended up recording and releasing the whole exchange on news station KTUU. The pastor works for a local professional hockey team and knows people in the local media through his day job. After a member of his church who had volunteered to record the event backed out, Krause contacted a local reporter who offered to send a professional crew. "I didn't put much thought into it honestly. She sent a crew and they videotaped the whole thing," he said. "It kind of just exploded from there." Krause said he really didn't want there to be so much attention brought to the $1,900 tip for Felber, but he's happy their gesture has garnered "a positive story in the news" for the Church. "Lately in the news it's always been about how churches are against one thing or another and people lose sight of all the benevolent giving churches do," he said. "Churches all over the place do more than this on a weekly basis and you just never hear about it. This has just been a sneak peek at some of the giving that happens at the local church." Felber was not only grateful for the $1,900, but thankful that there are people out there looking to help someone in need. "One of my favorite things that [Felber has said after getting the tip] was 'You know I've always heard God works in mysterious ways and I never believed that until today.' I thought that was pretty cool. Obviously, God's doing something in his life and he recognized it," Krause concluded.